For centuries, the main sources of livelihood in Qatar were pearling, fishing, and trade. At one time, nearly a third of the Persian Gulf fishing fleet was Qatari. However, with the Great Depression and the introduction of Japan’s cultured pearl industry, pearling in Qatar declined drastically. In 1935, an oil concession was granted to the Qatar Petroleum Company, a subsidiary of the Iraq Petroleum Company, which was owned by Anglo-Dutch, French, and US interests. High quality oil was discovered at Dukhan, on the western side of the peninsula, in 1940. However, the outbreak of World War II delayed exploitation of Qatar’s oil resources, and oil exports did not begin until 1949. During the 1950s and 1960s gradually increasing oil revenues brought prosperity, rapid immigration, substantial social progress, and the beginnings of Qatar’s modern history. In 2009, the oil and gas sector accounted for 46.2 percent of GDP, for the first time overtaken by the non-oil and gas sector, which accounted for 53.8 percent of GDP. Oil and gas have made Qatar the second highest per capita income country in the world (2009: 76,000 USD). Proven oil reserves of 33 billion barrels (condensates included) should ensure a continued output at current levels for the next 90 years, according to the European Commission. 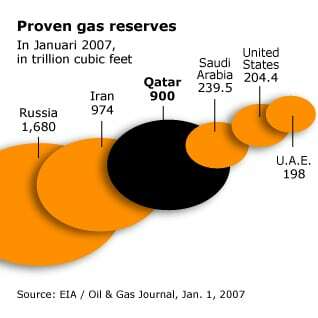 Qatar’s proven reserves of natural gas are more than 900 trillion feet, about 14 percent of the world total and the third largest in the world. The Qatari government is making an effort to diversify its economy away from oil. To achieve that, it has earmarked 5 billion USD for further industrialization projects (aside gas and oil) during the early 21st century. The tourism and construction sector are at the helm of Qatar’s diversification strategy. The government plans to invest 15 billion USD in new hotels and a new tourism campaign, and hosting of special sporting events such as was the case in 2006 with the Asian Games. The construction sector has also seen a boom, due to a notable increase in government spending on infrastructure, and also due to change in investment laws allowing foreigners to have full ownership in some parts of the country. The Qatari manufacturing sector, especially its steel production capability is also making important strides in becoming a major part of Qatar’s non-oil sector. Qatar’s nominal GDP grew in the period 2005-2009 with an average of 27.2 percent a year. Real GDP growth was 17.4 percent a year in the same period. In 2008 GDP reached a record 110.7 billion USD (at a growth rate of 37 percent), it declined in 2009 with 11 percent to 98.3 billion USD, but recovered in the first quarter of 2010 to 28.1 billion USD, 22 percent higher than in the same period of the previous year. The nominal growth of GDP over 2010 is expected to be 28.1 percent (real growth: 14.5 percent) and 25.5 percent (real: 17 percent) over 2011. Qatar’s gross domestic product (GDP) in 2015 was $164.64 billion, down from $206.22 billion in 2014 and $198.73 billion in 2013. According to the International Monetary Fund (IMF), GDP per capita in 2015 was $68,940, the highest in the Middle East and North Africa. GDP growth declined to 3.6 per cent in 2015, due to falling production in the oil and gas sectors, and slowing growth in the non-oil sectors. This was against a backdrop of weak consumer confidence, and subsidy and other public-spending reforms. Despite these changes, the World Bank predicts that Qatar’s economy will continue to grow at a moderate rate, by 3.6 per cent in 2017, 2.1 per cent in 2018 and 1.3 per cent in 2019. Inflation in 2017 is projected to be 3.1 per cent, compared with 3 per cent in 2016 and 1.8 per cent in 2015. In light of the uncertain medium-term outlook for the gas sector, the World Bank stresses the need for Qatar to develop its non-oil industries. Qatar ranked 18th in the Global Competitiveness Report 2016-2017, down from 14th place in 2015-2016. Among the main challenges facing Qatar is the drop in global oil and gas prices, which have impacted fiscal and current account balances. The current account deficit is expected to stay elevated for some time, due to FIFA-related capital imports for the hosting 2022 World Cup. Other risks include price fluctuations in the global financial markets and instability in the region, both of which are affecting capital inflows. Qatar’s transportation sector is expanding, with Qatar Airways being the owner of one of the biggest and most modern fleets anywhere in the Middle East, whilst its services have won some of the highest number of rewards in the travel industry. The cornerstone of Qatar’s economy is the exploitation of its hydrocarbon resources. 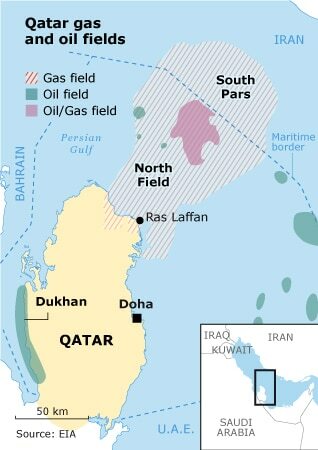 Since the mid-1980s, there has been a major breakthrough in the economic situation, with the discovery of the world’s largest known non-associated offshore gas field in Qatar territory, placing the country third in terms of world natural gas reserves. Considerable resources have been invested in the development of facilities to exploit, process, and export this invaluable commodity. The proved reserves of gas are over 900 trillion cubic feet, 14 percent of the world total and the third largest in the world. The gas exports in 2005 amounted to 31.6 million metric tons. The proved reserves of oil are 33 billion barrels (condensates included), which should enable continued oil production at current levels for the next 90 years (according to the European Commission). Oil exports (2008) amounted to 768.5 thousand barrels a day. The risks of the dependency on hydrocarbon resources were illustrated in the fourth quarter of 2008. Due to fluctuations in the prices of oil and gas on the world market, current price GDP in the fourth quarter was 22.3 percent lower than in the third quarter. Nevertheless, for the year 2008 as a whole, the output of the oil and gas sector was up 56.8 percent compared to 2007, with a growing contribution from the liquefied natural gas (LNG) industry. In 2008 gas overtook oil as the largest contributor to the economy. Oil and gas together accounted for 46.2 percent of the overall GDP (2009), for the first time overtaken by the non-oil and gas sector. Qatar is building a carrier fleet for the worldwide transportation of liquefied natural gas, consisting of 56 vessels, including the largest in the world. 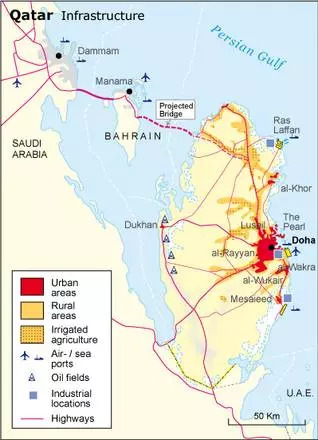 The liquefied gas supply from Qatar to the United Arab Emirates (UAE) and Oman travels along the Dolphin project, a sub-sea gas pipeline, with a daily production rate of two billion standard cubic feet of gas. Qatar has also entered into the steel industry in order to develop a new way to transform its energy into high-quality products for the export market. With Qatalum, starting its production in 2010, Qatar will have a basic industry that will set the basis for new downstream. The country already has a steel industry, de Qatar Steel Company (QASCO). Qatar was the first Gulf State to build its own petrochemical industry. 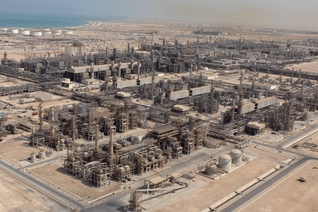 The Qatar Petrochemical Company (QAPCO) was established in 1974 and began production of ethylene and sulphur in 1981. The Qatar Fertiliser Company (QAFCO) was founded in 1969, to produce ammonia and urea. As well as being a major oil and gas producer and exporter, Qatar also boasts a diversified and fast-expanding industrial sector with a variety of heavy, medium, and light industries concentrated in three industrial areas: Mesaieed Industrial Area, the new Ras Laffan Industrial City, and the Doha Industrial Area. The share of the non-oil and gas sector in 2008 in the economy was 38.3 percent. The construction sector grew by 24.1 percent. In recent years, new economic and market liberalization policies have been adopted to consolidate and expand foreign and private sector involvement in the economy. A number of new measures and laws have been introduced, including the creation of the shareholding Qatar Industrial Manufacturing Company and the Qatar Industrial Development Bank. 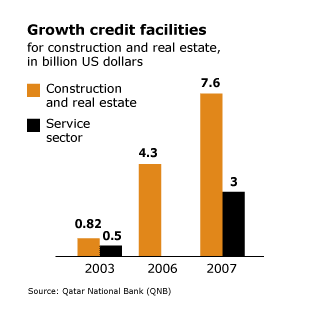 Official statistics of the Qatar National Bank (QNB) underline these observations. They are nothing less than spectacular. For example, credit facilities to the local construction and real estate sector grew from USD 4.3 billion in 2006 to USD 7.6 billion in 2007. This means that credit supply to the sector rose 77 percent in only twelve months. This figure is even more impressive when compared to the credit supplied to the sector only four years ago, in 2003: USD 0.82 billion or a mere 10.7 percent of the current total. The local services sector enjoyed a similar surge of investments from USD 0.49 billion in 2003 to USD 3 billion in 2007. On 27 June 1995, Hamad bin Khalifa and his supporters acted: the old Emir was ousted in a bloodless coup. By mid-1998, Qatar was estimated to have secured more than USD 6 billion in foreign investments. 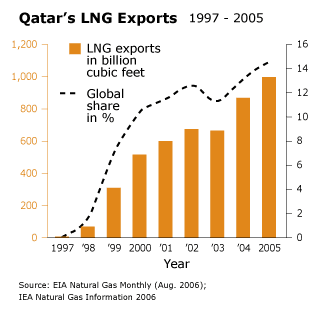 In the previous year, Qatar had shipped its first liquefied natural gas (LNG) from the North Field to Spain. Finally, some return could be expected on the massive North Field investments. But the very same year the first North Field LNG was exported, oil prices dropped again. It was only the divestment of several state enterprises that kept Qatar’s national budget deficit from reaching double digits in 1998. 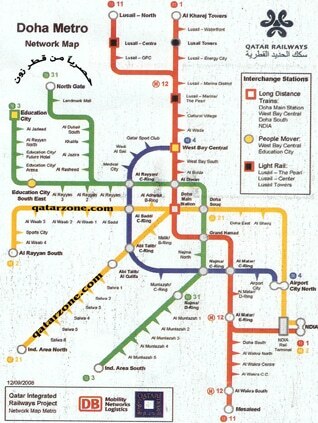 Surprisingly, confidence in Qatar’s development remained strong. At the end of 2001, the total amount of project finance secured by Qatar through bond issues and bank loans exceeded USD 12 billion. The trust the financial world had shown in Qatar’s development finally started to pay off when oil prices went up again in 1999. Higher prices coupled with increasing gas and oil exports – necessitating a flexible attitude towards official OPEC quotas – turned Qatar’s billion-dollar deficits into a small surplus in 1999. The statistics of the Qatar National Bank (QNB) are an indication of the belief of bankers and investors in the future of Qatar’s economy. Or at least, their belief in the almost unlimited amount of money that is available for (re)investment. It also demonstrates how successful the country has been in freeing itself from economic hardship following the Decade of Plenty of the 1970s. During that decade, oil revenues in Qatar reached spectacular heights, first after the oil crisis of 1973 and again after the nationalization of the oil industry in 1976. In the same period, Qatar’s ruling elite created a lavish welfare state based almost exclusively on oil revenues. However, when prices on the oil market decreased sharply in the 1980s, it became clear how much Qatar’s economy depended on this one, finite, commodity. At that time some analysts predicted that Qatar would run out of oil within twenty to thirty years. Budget deficits had already begun to appear early in the 1980s, and the end of the welfare state loomed – and thus the political system of strategic wealth distribution amongst citizens. Gradually a rift began to appear between the older, more conservative generation and a younger generation within the Family who pressed for liberalization of the now stagnant local economy. 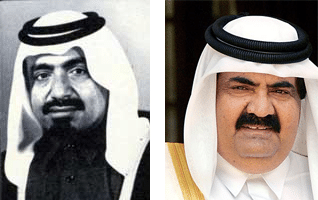 The older generation was linked to the then Emir Khalifa bin Hamad, who considered Qatar’s ultra-conservative neighbour Saudi Arabia to be the emirate’s natural, political, and economic ally. The group of reformers coalesced around the more Western-minded Crown prince Hamad bin Khalifa. They wanted to radically open up the economy to attract more foreign – Western – investors. In particular, they wished to seek foreign funds to exploit the country’s huge natural gas reserves in the offshore North Field. This field had already been discovered in the 1970s. Its extremely costly development had, however, been put on hold after 1986 due to financial constraints. In an interview with The Financial Times in October 2007, Qatar’s current Minister of Finance and Economy Youssef Hussein Kamal, commented on the country’s economic situation in 1992. In that year he was appointed undersecretary of Finance, Economy, and Trade in a country on the verge of bankruptcy. ‘We couldn’t even pay government salaries then,’ Kamal said. But instead of a further tightening of the fiscal belt, Kamal and other members of the group surrounding the Crown prince decided to continue to tap the international bank and capital markets. 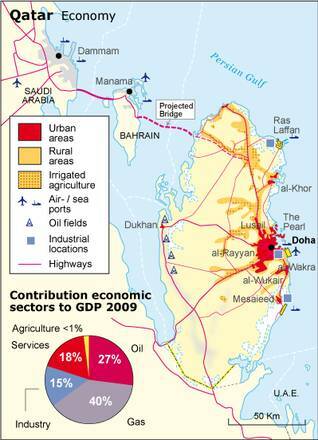 Agriculture and fishing – once the mainstays of Qatar’s economy – account for a miniscule 0.07 percent of GDP. Since at least the 1970s, the country’s government has talked about ‘diversification’, by which they mean the development of alternative industries and services to reduce the nation’s dependence on hydrocarbon commodities. As one of the main components of economic development, the agricultural sector in Qatar is getting a lot of attention from the government, who has been working to remove natural obstacles that impede extension of agriculture by supporting farmers and encouraging national investments in the agricultural sector. The agricultural activity in Qatar focuses on developing modern irrigation systems, categorizing farms, improving the quality of agricultural production, introducing modern scientific and technological techniques, and diversifying farming production. One of the practical steps taken in this direction was the agreement with the University of Qatar to introduce a program in the Faculty of Science to instruct national cadres in agricultural sciences. The Agricultural Development Department is responsible for drawing up agricultural and livestock development plans and programmes, establishing experimental and model farms, marketing the products of these farms, providing farming services for farmers, issuing agricultural licenses and applying agricultural and veterinary quarantine procedures. The Agricultural and Water Researches Department is responsible for carrying out field experiments and studies on horticulture, crops, forage, utilization of irrigation water, water conservation and implementing scientific and technological means of agricultural and water development. The Department of Fish Resources is responsible for protecting, developing, manufacturing and optimizing the utilization of the resources of marine life and supervising the implementation of this policy, managing fishing affairs, modernizing fishing techniques and equipment, securing the requirements of the fishing profession and licensing fishing professionals and fishing boats. Fishermen and farmers are offered loans to enable them to increase their productivity. Deterring actions are taken to prevent fishing in protected areas, and fishing by means of dredging is prohibited in order to conserve aquatic life and fish resources. Governmental experimental farms work in the field of agricultural experimentation, with the aim to produce locally suited breeds of agricultural products. Agricultural experiments have also been carried out on horticulture in a controlled environment as part of the research to produce better and new varieties. Varieties of tomatoes were also farmed in a green house under a special drainage system with the use of sand and organic fertilizers. Qatar has its sights set on banks involved in project finance and private banking, as well as commercial and investment banking. The fruits of the country’s booming economy can be seen in investment across all sectors, stretching to education and health care facilities. More than ten billion USD of public funds are being pumped into roads, sewerage and a new airport, in a four-year infrastructure upgrade aimed at addressing the needs of a rapidly expanding economy. Meanwhile, the private sector is investing billions of dollars in new residential, commercial and hotel space to cater for the influx of companies, professionals and visitors. Qatar Airways signed a deal for a fleet of 60 Airbus A350s, worth 10.6 billion USD. Qatar is investing up to 500,000 USD per citizen over the next five years in the economic and social infrastructure, notably in education. More than 8 billion USD has been set aside for health care research, and according to the government this is the largest cash endowment of its kind anywhere in the world. 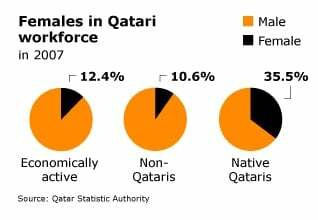 According to the 2009 survey by the Qatar Statistics Authority, Qatar has an economically active population of 1.26 million people, 10 percent of whom are female. For 2004 these figures were 437,000 economically active people, of whom about 15 percent were female. Of the ‘economically inactive’ males, most (72.9 percent) are students. 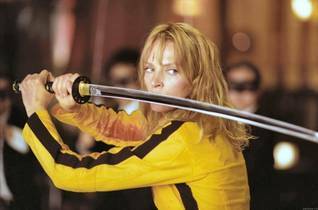 Most of the ‘inactive’ women (69.2 percent) are housewives. An overwhelming majority of 88.6 percent of the employed Qataris work in the public sector. 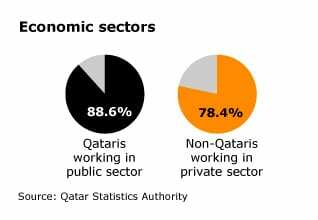 This does not leave much room for non-Qataris in government offices or companies: 78.4 percent of them work in the private sector. This means that only about 11 percent of the ‘national’ labour force work in the nation’s private sector. The unemployment rate (2007) is very low at 0.5 percent (down from 3.9 percent in 2003 and 0.9 percent in 2006). The unemployment rate for non-Qataris was even lower, at 0.3 percent, but this last figure is influenced by the fact that non-nationals have to leave the country when their contract expires and they are unable to find a new job. The unemployment rate for ‘nationals’ is 3.2 percent. The unemployment survey also shows that non-Qataris work longer hours (53 hours a week) than Qataris (38 hours a week). No information is available on average payments to the different nationalities. For Qatari women, unemployment is a substantial 6 percent (Qatari men: 1.7 percent). Non-Qatari women have the same unemployment rate as Qatari men: 1.7 percent. No information is available on salary differences between the sexes. In the Qatar National Vision 2030, the blueprint for the social and economic future of the country released in October 2008, one of the goals was ‘having a world-class infrastructure backbone’. Estimates set the budget for Qatar’s four major infrastructure projects at 21.6 billion USD. Among these developments is a 2.7 billion USD causeway that will link Qatar with the island state of Bahrain, the construction of the New Doha International Airport, which will be completed in 2015 and will be able to handle 24 and eventually 50 million passengers a year (it handled 15 million passengers and 360,000 tons of freight in 2007), and a large new port project at Mesaieed, 35 kilometres from the capital. Of great importance and impact will be the country’s first foray into rail. The German firm Deutsche Bahn will design the country’s first railway network, encompassing a light rail project in and around Doha, along with heavy freight and mainline passenger services. The project foresees a passenger and freight railway along the eastern coast, linking the Ras Laffan industrial complex with Doha and the port of Mesaieed, and across the planned bridge to Manama in Bahrain. 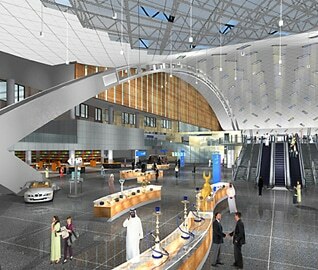 Furthermore a freight link to Saudi Arabia, a metro system in Doha and a light rail system connecting the urban centres of Lusail, West Bay and Education City is planned. The projects are designed to move towards a broad based economy, and moving away from dependence on energy. Qatar is trying to position itself as a major cargo handling centre for the region. Apart from Doha International Airport, Qatar has four other airfields, of which two are paved. There are four commercial ports: Doha, Ras Laffan, Halul Island and Mesaieed. 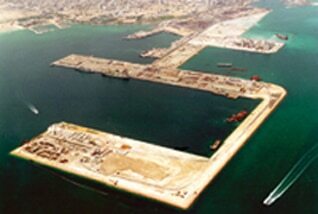 In Mesaieed a new port, officially called New Doha Port, is under construction. There are two terminals for transport of offshore oil and gas production: al-Shaheen and al-Rayyan. Currently Qatar has a total road network of 7,790 kilometres (2007 estimate), of which 1,107 kilometres are paved. The network is linked to Hofuf in Saudi Arabia and Abu Dhabi in the United Arab Emirates. While the foreign capital invested in Qatar’s oil and gas industry is overwhelmingly Western, it may come as a surprise that Qatar’s main export markets, totalling 56.6 billion USD (2008), are in Asia. In 2008, 79.4 percent of export earnings came from non-Arab Asian countries. Japan is Qatar’s main export market with a 39.9 percent share in 2008, followed by South Korea (19.9 percent), Singapore (9.9 percent), India (5.1 percent) and Thailand (4.9 percent). Among Arab countries the UAE are by far Qatar’s largest export market with a 4 percent share. With a mere 0.4 percent, the United States form an almost negligible export market for Qatar. Spain and Belgium are the only Western countries to form a substantial export market. Conversely, on the other side of the balance sheet, the United States turns out to be the biggest supplier of commodities on the Qatari market (total imports in 2008: 25.1 billion USD). According to official Qatari statistics the US accounted for 13.3 percent of imports in 2008, followed by Italy (10.8 percent), Japan (8.9 percent), France (7.9 percent), Germany (7.3 percent). The United Kingdom (5.7 percent), South Korea (5.6 percent), the UAE (5.1 percent) and Saudi Arabia (4.3 percent) were the Emirate’s main import markets. Roughly one third of Qatar’s imports consist of machinery and mechanical appliances, a quarter are base metals, almost 15 percent are vehicles and other transport equipment, and about 5 percent are food products. 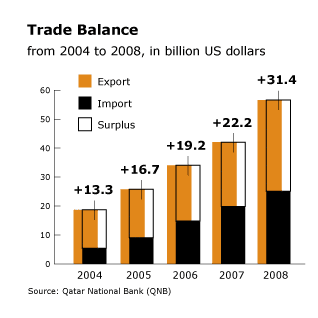 Because the steady rise in export earnings has been accompanied by an almost corresponding rise of import spending, Qatar’s trade balance has remained relatively stable in recent years. It reached a surplus of 31.4 billion USD in 2008. The oil revenues as a percentage of total state revenues have also remained relatively stable. This is largely explained by the fact that the state is still very successful in acquiring investment capital, which is considered part of the total state revenues. 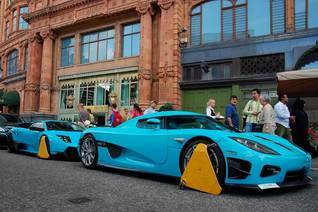 They are much coveted because government expenditure is rising at an increasing rate. So while the state records an impressive overall balance surplus (19.8 percent of GDP for 2007), this surplus is not only dependent on the continuation of high oil prices but also on continuing investments – and therefore trust – in the local economy. Most of Qatar Investment Authority’s (QIA) assets are currently invested inWestern countries, especially Great Britain. For example, the QIA has bought a 20 percent stake in the London Stock Exchange, 25 percent of the supermarket chain Sainsbury’s, and 10 percent of Barclays. However, it is also investing heavily in South-east Asia, especially China. The Asian portfolio, which is planned to account for 40 percent of QIA’s total assets, is dominated by investments in real estate projects and Chinese banks. It is far from inconceivable that the Asian portfolio will eventually outgrow the Western portfolio, especially since Kenneth Shen, a China expert known for his Asian contacts, has been appointed as QIA’s head of strategy and private equity. The economic buying power of the Gulf States has come under increasing scrutiny by Western politicians in recent years. They publicly warn against the perceived threat of the oil-rich Gulf States using their swollen investment vehicles for political aims. The answer from the accused governments is invariably that they are only in it for the money. However, there can be no doubt that multimillion dollar investments come with at least some political influence. The fact that Qatar has invested heavily in real estate in Syria, thereby propping up the latter’s ailing economy, has certainly been beneficial to mutual relations between these two countries. Qatar also has more direct ways to gain political profit and influence through the external distribution of petrodollars. 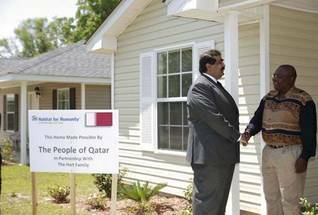 When New Orleans was hit by Hurricane Katrina in 2005, Qatar sent USD 100 million in aid to support its victims. This was a great public relations feat, primarily aimed at Qatar’s main military ally, the United States. Moreover, this generous gift gave the Emir the moral leverage to send millions of dollars to Palestinians in the Gaza Strip under Israeli siege, and even more millions to Lebanon for reconstruction of the Shia south after the Israeli air attacks of 2006. Continuing accusations of financial opaqueness, which are considered more disturbing with the growing economic power of Qatar, have led the authorities to introduce some government reforms. Most importantly, in July 2007, it was announced that a unified regulatory authority for the financial services sector, modelled on global standards, would be created. These measures should increase financial transparency and efficiency. The Qatar Investment Authority (QIA), Qatar’s sovereign wealth fund, is in charge of domestic and foreign investment. It was established in 2005. Its mission, according to Article 5 of Emiri Decision No (22) of 2005 (the QIA Constitution), is to ‘develop, invest and manage the state reserve funds and other property assigned to it by the Supreme Council in accordance with policies, plans and programs approved by the Supreme Council’. The QIA is chaired by Sheikh Tamim bin Hamad Al Thani. The Chief Executive is Sheikh Hamad bin Jassim bin Jabr Al Thani. Most decisions are made under their patronage although QIA claims to be a professionally managed investment fund. According to the QIA, its task is to diversify the Qatari economy by taking steps inside and outside its territory to expand the non-hydrocarbon industry. Measures include promotinal activities for the Asian Games; the creation of the Qatar Financial Centre Authority; property and project development by Qatari Diar Real Estate Investment Company; creation of Qatar Airways; and the establishment of new educational facilities. Outside Qatar, the QIA invests in asset classes such as equities and fixed income and private equity, as well as through direct investment. QIA has taken advantage of the consequences of the financial crisis, i.e. the collapse of large institutions and international banks downsizing in their non-core markets. Among their shares and stakes, the QIA holds 10-15 percent of Fisker Automotive with an investment of USD 65 million to develop the hybrid sports car called Karma. The QIA was part of the investment group that purchased Miramax Films from The Walt Disney Company in 2010. QIA was also linked to a takeover of Everton F.C. in a deal worth USD 320 million. 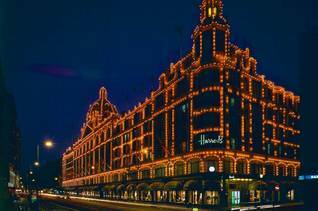 Qatar Holding, an indirect subsidiary of QIA, purchased the Harrods Group, including the Knightsbridge department store. QIA is also the largest shareholder in Sainsbury’s. In addition, it has also acquired stakes in LVMH, the French luxury group that owns Louis Vuitton leather goods, Christian Dior perfume and Moët et Chandon champagne, and Tiffany, the US jewelry retailer. In 2007 Qatari property group Barwa Real Estate bought an international conference centre near the Arc de Triomphe for USD 525 million and the Royal Monceau hotel for USD 325 million. The QIA bought, for USD 572 million, HSBC’s head office at Avenue des Champs Élysées in 2009. Qatar’s sovereign wealth fund has reportedly agreed to pay more than USD 650 million for a retail and office building on Avenue des Champs Élysées in June 2012, also granting the ensemble of the French suburbs an endowment of USD 130 million. Qatar also holds also stakes in the French Total oil company. In February 2012 QIA completed the acquisition of Credit Suisse’s headquarters in London. QIA holds a 6 percent stake in Credit Suisse and owns shares in Songbird, the majority owner of Canary Wharf Group. Qatari Diar, a property arm of the fund, along with Canary Wharf, won a USD 480 million deal to redevelop the Shell Centre in London that houses the Royal Dutch Shell’s London headquarters. In May 2012, it acquired a stake below 3 percent in Royal Dutch Shell. A 3 percent take would be worth USD 6.4 billion based on Royal Dutch Shell’s current share price, and would make Qatar the third largest shareholder in Shell. Qatar will also invest up to USD 5 billion into the funding of infrastructure development in Bangladesh; an investment that would cover the power sector, roads, airports and river dredging. Qatar will furthermore deposit USD 1.8 billion into the Central Bank of Bangladesh. Qatar National Bank (QNB) was established in 1964 as the country’s first Qatari-owned commercial bank, 50 percent of which is owned by Qatar’s sovereign wealth fund. It is currently the largest lender in the Middle East with USD 91 billion in assets (2012). QNB has been expanding by acquiring European subsidiaries in the Middle East. QNB holds stakes of 39,9 percent (2012) in Dubai’s Commercial Bank International (CBI) and is in the process of buying France’s Société Générale’s majority stake in the Cairo-based subsidiary. Tourism accounts for 11.4 percent of Qatar’s current GDP. In 2004, the government announced a plan to invest 15 billion USD in tourism projects. In 2005 the country received three and a quarter million of tourists, a number that will grow to one and a half million by the year 2011. In the same period the number of 4- and 5-star hotel rooms will increase from 2800 to 16,500. 28 percent of the tourists come from Europe, 20 percent is of domestic origin, 16 percent come from neighbouring countries in the Middle East, 15 percent from the Americas and another 15 percent from the Asia/Pacific zone. Qatar aims at what the Qatar Tourism Authority calls ‘sustainable tourism’. For that purpose a number of cultural projects has been realized in Doha: the Qatar National Museum, the Museum of Islamic Art (designed by the architect I.M. Pei), the Qatar National Library (architect Arato Isozaki) and the Qatar Photography Museum (architect Santiago Calatrava). With the construction of luxury beach resorts at al-Fareej and al-Mafjar, development of Qatar’s long coastline has finally begun.